When you fill in a form online there will always be a tick box which says “I do not want my details passed on to partners or third parties”. However, don’t you find that no matter how vigilant you are; your number always seems to end up in the hands of cold callers! If you don’t want to give your actual phone number and would like to force them to use your email address instead – there is a way! 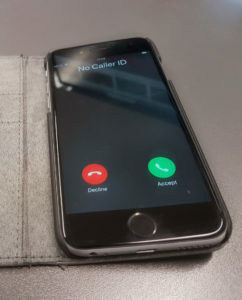 A free call blocking service called Truecall38 exists to help you, If a website forces you to type in a telephone/ mobile number; type in 0333 88 88 88 88 instead (if it doesn’t fit, leave off the last digit). Then.. whoever calls this number receives the following message “Truecall38 is handling my calls. I prefer not to be contacted by phone so please contact me via my e-mail address. Use the TPS (Telephone Preference Service). It’s free and official ! Type in your number(s) and by law all organisations, (including charities, voluntary organisations and political parties) must not make any unsolicited sales or marketing calls to any registered numbers contained within the TPS – unless they have your consent to do so! Once your number has been registered for more than 28 days, and you still receive such calls, you can complain and your complaint will be passed to the ICO (information Commissioner’s Office) on your behalf.